Carl Huffman CSP is a speaker and trainer for many Fortune 500 companies -- Siemens, Graybar, MetLife, American Management Association, Ameritech, Hilton Hotels, Mallinckrodt, Munters, CUES and many others for over 30 years. He holds a BA degree in Speech from Indiana University; he is past president of the Illinois Chapter of the National Speakers Association. Carl received the Toastmasters Communication and Leadership Award and the National Speakers Association designation of Certified Speaking Professional*. He is a member of The National Speakers Association and The American Society of Training and Development. Prior to founding Huffman Enterprises, Mr. Huffman was CEO of two corporations. His book "A Dictionary of Sales" was published in 2000. 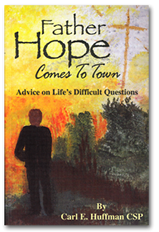 He was also a contributing author to "Thriving on Change" published by Select Press. 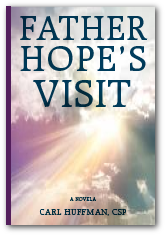 He has authored two books; Father Hope Comes to Town and Father Hope Returns and his latest work, Father Hope’s Visit a Novella. Carl is listed in "Who's Who in America." 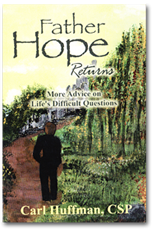 Mr. Huffman has been a practicing Catholic-convert for over three decades. He has been a member of a local parish council, President of an Education Commission, Social Committee Chairman, Home and School committee chair, Vice President of St. Edward High School Foundation, and currently serves as a Lector, and a Eucharistic Minister. In the past ten years Carl has been active as a Retreat Leader and Small Group Leader in the Renew and SINE Programs. He has also participated in several pilgrimages including one to Rome Italy and completed his Cursillo retreat experience in April 2003. For three years he served as Co-Chairman of the Corporate Relations Committee for DuPage Habitat for Humanity. Mr. Huffman lives in Geneva Illinois with his wife Judy. Their two children have both received their BA degrees. Their son completed his Masters work in Education and is teaching fifth grade in Geneva, Illinois. Their daughter graduated from Valparaiso Law School and is a member of the corporate council at Eli Lilly and company in Indianapolis, Indiana. *CSP is a professional designation given for demonstrated excellence in the speaking and training profession. Only about 10% of the National Speakers Association 4000 members have achieved this designation.